I like statistics. Sometimes it can be misleading or data can be hard to interpret. But it can help us when we struggle to see the forest for the trees. The last two years the IP-based mobile technologies were booming. If you are working with 4G networks you know it well. This year however the number of new deployments decreased significantly (Sep 2017, source GSMA). Well, there can be many reasons for that. Rather than guessing, let’s have a fun and take a look on how popular are some telco topics on Google in the last 3 years. The similar idea maybe had the founders of testRTC. In the latest videos we can see demos of their tools. T-Mobile USA is on the cutting edge. It was the the first operator who came with HD Voice back in 2013. This month they announced a new upgrade of their network – to Enhanced Voice Services (EVS). From the customer perspective it means a better audio quality – even better than HD. EVS does this with a broader audio frequency range, which translates to richer, more realistic-sounding voice audio. The EVS is supported for both VoLTE and VoWifi. Additionally for the LTE technology it also brings a higher reliability in areas of weaker signal. T-Mobile has a pending patent for their solution where their customers with EVS compatible phones will benefit even if the B-party doesn’t have an EVS-capable device. Currently the technology is available for LG G5, Samsung Galaxy S7 and S7 edge. T-Mobile plans to support four more smartphones by the end of 2016. I wonder what will be the response of Alliance for Open Media for webRTC. WebRTC was a buzz word a few years ago. The cool demonstrations lead to doubts of many operators and communication companies about their own solution. But this also meant a lot of expectations which couldn’t be fulfilled immediately. WebRTC is a technology not a solution. To introduce it in mobile networks when we go in detail is not without challenges. Anyway the WebRTC is (for someone) slowly gaining its momentum and there are quite a few trials already. 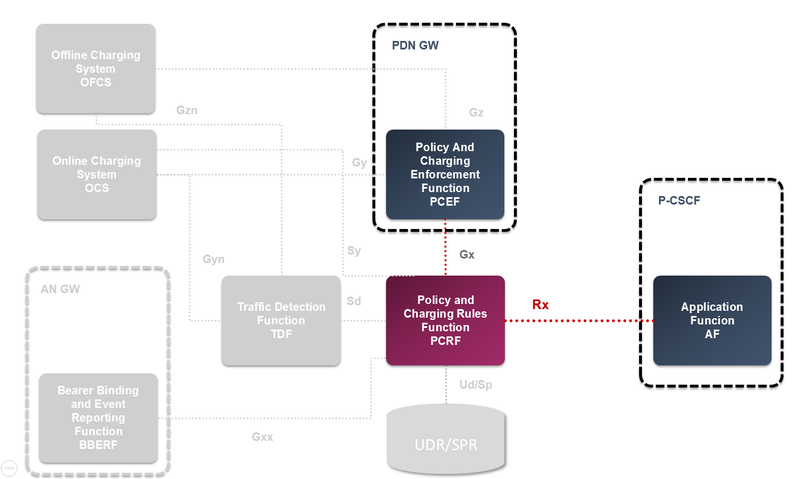 Would you be interested in the GSMA view how to implement the WebRTC in the mobile networks’ context check this whitepaper out – GSMA WebRTC to complement IP Communication Services. In the IMS we have separated signalling and media data. However a full independence of control and user plane is not desirable. We want to control when the media starts and stops, we want to be sure about media routing, we want to ensure Quality of Service (QoS). And, of course, we want to accordingly charge the users. In VoLTE is the AF incorporated within the Proxy-CSCF. The P-CSCF provides the information related to the control plane signaling. The information is taken from SIP/SDP session setup and it is forwarded to the PCRF via the Rx reference point. Each new SIP message that includes an SDP payload or session events (e.g. session termination, modification) can trigger a new request sent towards the PCRF. This ensures that the PCRF gets the proper information in order to perform reliable PCC.